TCDM provides possibility to ship mouse embryos and sperm. Freshly collected preimplantation mouse embryos from 1.5 to 3.5 dpc can be shipped at ambient temperatures within 48 hours. In addition, fresh sperm within the epididymis can be transported at refrigerated temperatures (4-8°C). Cryopreserved embryos and sperm can be transported using a dry liquid nitrogen shipper available at the TCDM. 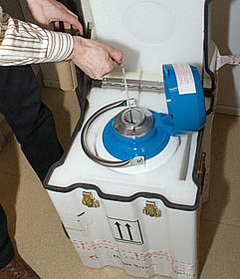 It is also possible to transport frozen sperm on dry-ice between laboratories. This removes the need for the receiving facility to return a dry-shipper. It is essential to attach the original cryopreservation and thawing protocol. The advantages of shipping embryos and/or sperm include cost of shipment as well as simplified and relatively rapid rederivation of imported strains into SPF colonies. Most pathogens are unable to penetrate an intact zona pellucida and infect preimplantation-stage embryos, thus by shipping embryos, quarantine at the receiving animal facility can be avoided. Therefore it appears to be a fast, cheap and effective way to ship mice and clean them up.